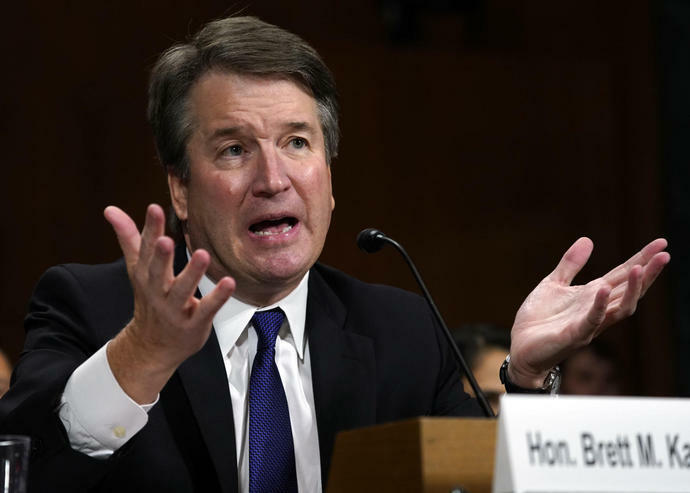 WASHINGTON (AP) -- Just 1 in 4 people thinks Brett Kavanaugh was completely honest when he heatedly rebuffed charges of sexual assault and heavy drinking during his Supreme Court confirmation hearing, and Republicans and Democrats hold starkly divergent views of whether his sworn testimony to senators was credible, a poll released Friday showed. The Associated Press-NORC Center for Public Affairs Research survey also found that the public was unimpressed by how major players handled the extraordinary battle, which culminated Oct. 6 in a near party-line confirmation of Kavanaugh by an exhausted Senate. President Donald Trump, Senate Republicans and Democrats and the FBI each earned approval from a third or less of the poll's respondents. Thirty-nine percent said they believe Kavanaugh was mostly honest but hiding something when he testified last month before the Senate Judiciary Committee, the drama's most unforgettable day. Another 31 percent said he was largely lying, and 25 percent said he was totally truthful. A combative Kavanaugh denied California college professor Christine Blasey Ford's testimony to the panel that he sexually assaulted her at a 1980s high school gathering when they were teenagers, and he rebutted classmates' descriptions of him as a heavy drinker. A breakdown of how people answered that question shows how stances over the bitter confirmation battle are deeply colored by people's political allegiances and less so by gender. Overall, 43 percent disapprove of Kavanaugh's confirmation while 35 percent approve. - The role played by Trump, who nominated Kavanaugh in July and criticized Ford and another accuser, was strongly or somewhat approved by 32 percent, about the same rating given to Senate Republicans. Senate Democrats won such approval from just 24 percent. - Only 3 in 10 said the FBI did a good job. Trump hurriedly ordered the agency to perform a brief investigation of the sexual-harassment allegations against Kavanaugh and said it found no corroboration in a probe Democrats criticized as insufficient. - Around 1 in 3 said that since Kavanaugh's confirmation they have a lot of confidence in the Supreme Court. The rest have only some or hardly any confidence in the nation's highest court. - Eight in 10 Democrats, compared to 6 in 10 Republicans, said a Supreme Court nominee's personal history and character are extremely or very important.